When he decided to go cruising, Randy says it troubled his father that he didn’t have a plan. He describes his dad as the sort of person who, “knows what shirt he’s going to wear next Wednesday.” To assure his dad he wouldn’t just be drifting about, he told Mims senior that he and Ideath’s quest would be to visit maritime museums. Mission defined, dad placated, he put to sea. 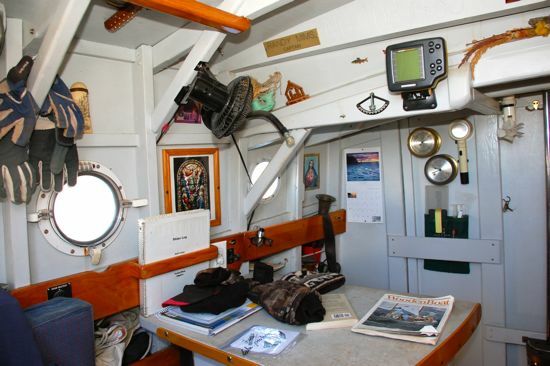 One of the things learned sailing offshore is that systems need to be simple and accessible. Here, Ideath’s galley. 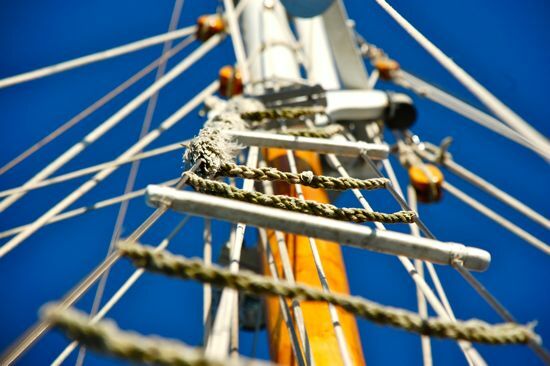 Rope ratlines make going aloft easier. During one stint of these ocean and marsh sessions, he spoke to almost no one for a month and a half. When he spoke with people again, in Fernandina Beach, Florida, he found he’d almost lost his voice. Since those early ocean adventures, Randy’s cruising has fallen into a seasonal routine. His museum quest led him to the Apalachicola Maritime Museum on Florida’s west coast. 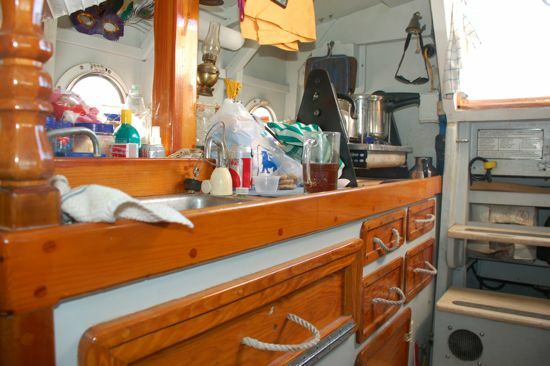 He pays for his travels by working 9 months to year as a silversmith but also on boats. Often in Apalachicola. Sometimes at the museum. Then he goes sailing a year, as far North as Maine. Once, he sailed nonstop and alone from from Apalachicola to Portland, Maine. It took 41 days. Occasionally the ocean bites him. Once Randy got caught in a Force 8 gale in the Gulf Mexico. To steady Ideath’s course, Randy shortened sail and sheeted the storm jib hard against the mast. To slow her progress, he deployed a 600 foot rope over the stern. 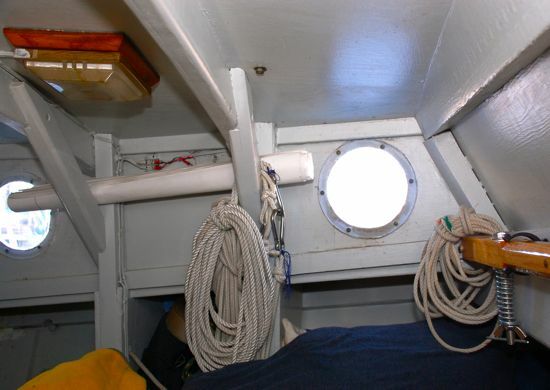 One end of the rope was attached to each quarter of the transom, forming a large bight that trailed the vessel. Things seemed well. Uncomfortable. But safe. These were the conditions he’d modified his vessel to weather. Ideath’s main cabin. Randy says its narrowness is an asset. It means he can’t be thrown as far if he looses his grip in violent seas. The wood knees that join the cabin house to the deck serve two purposes. They reinforce the deck joint and give Randy “something good to hang on to” when the weather is rough. Forepeak starboard side. 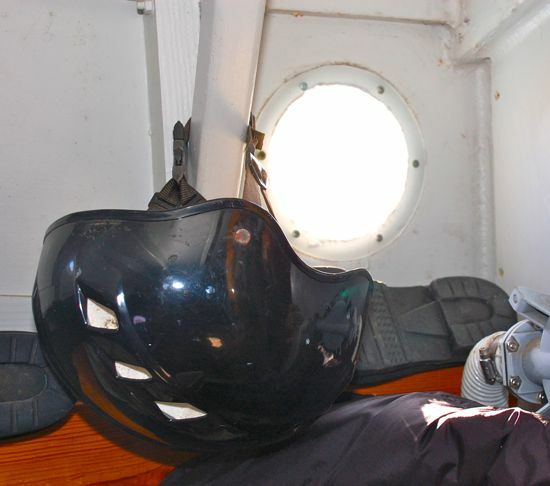 The helmet serves as protection under storm conditions. Randy has worn it twice in the past 10 years. Forepeak port side. Ideath’s reinforcing knees make an ideal place to store coiled lines. In heavy weather, the ports are covered with external plywood shutters for protection in case of a knock down. During the Gulf storm, the winds rose to over 30 knots. Ideath weaved her way among the 18 to 20 foot waves. Randy wanted to photograph the violent seas. As he waited in the cockpit with his camera, hoping to catch the perfect wave, an extra large one slammed into Ideath. The crash threw him hard against the coaming and he came to rest face down in the cockpit. Then the pain hit. Randy had a medical book aboard. Far in the gulf, in his wind thrown vessel, he diagnosed himself with broken ribs. Then he started the long sail to shore. The winds dropped. His injuries weren’t improving. With his torso seized in tape and pain he had to figure out how to operate Ideath’s sails, winches and lines. In the end he settled for a hand to mouth arrangement. It didn’t matter. He and Ideath had survived their test at sea.